I made this painting because I love octopuses. More importantly, I love how the human mind has the ability to make the connection between shapes without having all the detail. I was doing my best to go super abstract, but somehow I fell short. Anyway, I love the end result and as far as forcing myself to go even farther into the abstract world, there's always tomorrow. This is how I see cities. They are such vast colorful places, all man made monuments to man's desire to create things pleasing to the eye. Our own personal showcase of what we can do as a collective. And, please, stop feeding the birds... they're huge. I tried another Pen & Ink drawing this week. There was a little drama because I inadvertently started coloring in the heels with a Uniball pen! I almost cried. I'm a little bit of a pen snob and my favorite pens are Tul pens. Since I started with the red Uniball pen I couldn't change part of the way through, so I finished with it. It was rough and scratchy and I felt like it was going to scratch right through the paper! It also took me two hours to fill in. The next day I marched right over to Office Max and bought a new red Tul pen. I thought I'd go over it with the Tul pen to make it more uniform. It only took 20 minutes. Yes, that red blob to the left is my signature. When I first started doing art, the only medium I practiced was Pencil. Everything I did was hand drawn and all pencil. My art teachers made me try other mediums, but none of them stuck. One day, I took a watercolor workshop taught by my English teacher, Mrs. Diane Bykowski (an amazing artist). Needless to say, I did not like watercolor because it was too hard for a novice to painting, but her vision and expertise with a paint brush made my mind race. So, I started with paint that was much easier to work with, acrylic. My whole heart fell for painting. The colors, the depth, the ability to make my mistakes disappear with a single brush stroke- all of it, made me want more. So, for these many years since high school, I have not picked up a pencil with which to draw. I have only painted. A friend of mine that works with my husband is retiring and I chose to draw her something. I hope she likes it. 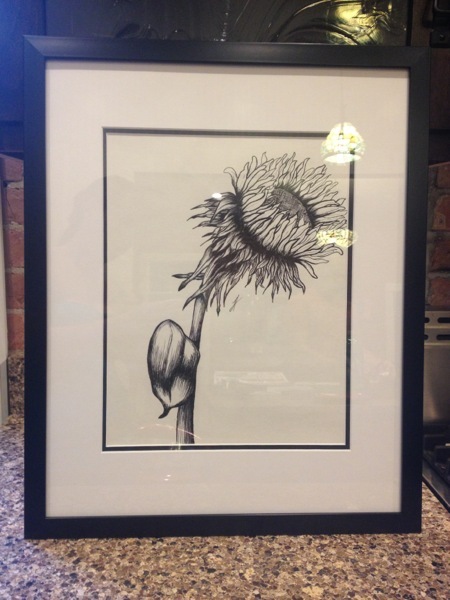 Not only is it a drawing, but a Pen & Ink drawing! I've only ever drawn 3 things in Pen & Ink that I can think of, and one of those is this! I used to think of ink as so permanent and unforgiving, but I recently read about Andy Warhol in Wikipedia, and it stated he often left his mistakes or blemishes in his pieces because they were a part of the process. 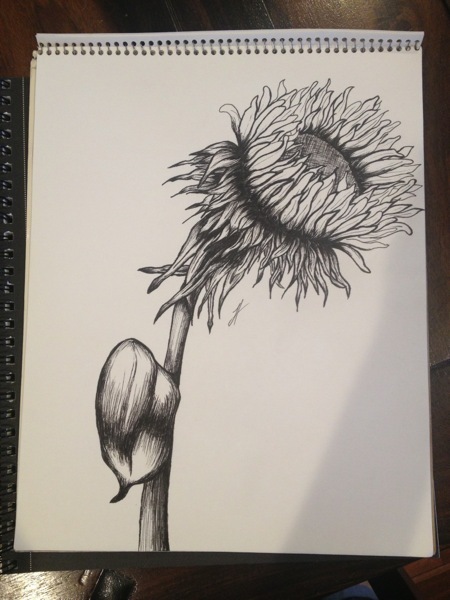 So, I thought, my pen and ink drawing could stand to have a few imperfections. Turns out- I may LOVE Pen & Ink! I will always love painting the most, but who's keeping score?! ;) Thanks to Mrs. Bykowski for sharing her love of art with me, and to Andy Warhol via Wikipedia for allowing me to make a few mistakes! I started this series to get back to the basics of painting, as well as to train myself how to see beyond the details. I want to focus on shape and color more than creating a perfect replica of an image. I'm figuring out how to give images shape and depth without shading and using multiple colors. I felt animals would be the perfect subject for this experiment, as they don't require many lines for the human brain to be able to tell what they are. The spunky colors are just to make me smile at how ridiculous the images are. This giraffe was modeled after some images of giraffes that I took at the Hogle Zoo. I loved the shape of Daphne's (the giraffe at the zoo) ears in one image, the eyes in another, and the sideways mouth in a third, so I just combined all three.